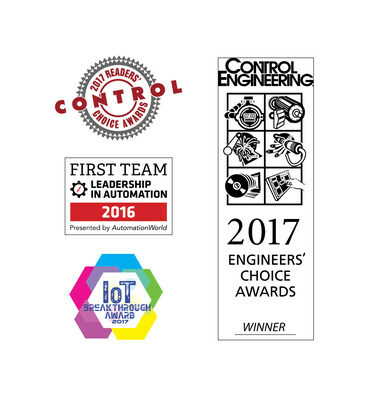 PORTLAND, Maine, Feb. 28, 2017 /PRNewswire/ — Kepware, a PTC business, announced today that it has recently received several prestigious industry awards and accolades for its IoT-friendly flagship product, the KEPServerEX® industrial connectivity platform. Determined by feedback from automation industry experts and end-users, these awards and accolades recognize KEPServerEX as an exceptional and innovative industrial connectivity solution. Kepware was selected as the winner of the “Software – Industrial Internet of Things” connectivity category for its KEPServerEX version 5.21 software by readers of Control Engineering. Nominees were evaluated on technological advancement, service to the industry, and market impact. Readers of Automation World named Kepware a preferred vendor in the “Networking—Wireless” category. The recognition is based on unaided recall surveys. Implementation and use of Kepware products by Faurecia, an international automotive parts manufacturer, was selected as one of three winning customer use case stories. All entries celebrated the ways that people and Information Technologies work together towards smarter manufacturing, and winners were decided based on the largest number of case study downloads. The Kepware KEPServerEX software was selected as the Industrial IoT Solution of the Year. Winners were evaluated by an independent panel of technology professionals with the goal of recognizing the best and brightest in the IoT market today. Readers of Control Global named Kepware a preferred vendor in the “OPC Connectivity” category. The winners were determined solely by readers’ fill-in-the-blank responses. This recognition comes after the recent launch of KEPServerEX Version 6, which includes a major update to the platform’s core server functionality and user interface. These enhancements further enable customers to meet growing productivity demands in today’s increasingly-global industrial landscape. KEPServerEX is an industrial connectivity platform that leverages OPC and IT-centric communication protocols to provide a single source of industrial automation data to enterprise applications. The platform offers a library of more than 150 device drivers, client drivers, and advanced plug-ins—enabling connectivity to thousands of devices and other data sources. @Kepware is a software development business of PTC Inc. located in Portland, Maine. Kepware provides a portfolio of software solutions to help businesses connect diverse automation devices and software applications and enable the Industrial Internet of Things. From plant floor to wellsite to windfarm, Kepware serves a wide range of customers in a variety of vertical markets including Manufacturing, Oil & Gas, Building Automation, Power & Utilities, and more. Established in 1995 and now distributed in more than 100 countries, Kepware® software solutions help thousands of businesses improve operations and decision making. Learn more at https://www.kepware.com/. PTC has the most robust Internet of Things technology in the world. In 1986 we revolutionized digital 3D design. Now our leading IoT and AR platform and field-proven solutions bring together the physical and digital worlds to reinvent the way you create, operate, and service products. With PTC, global manufacturers and an ecosystem of partners and developers can capitalize on the promise of the IoT today and drive the future of innovation. Kepware, the Kepware logo, and KEPServerEX are trademarks or registered trademarks of PTC Inc. or its subsidiaries in the United States and other countries.